The US has trumped its neocon ambition of spreading democracy throughout the Middle East by endorsing the very Arab authoritarian allies it denounced 25 months ago. The so-called "moderate" Arab states - Saudi Arabia, Egypt, Jordan and the Gulf states - are to receive massive boosts to their military with a delightful US$33bn package. Under the deal, America's Arab allies will receive sophisticated weaponry, including air-to-air missiles, satellite-guided weapons, and upgrades to their airforce. To silence criticism from Washington's pro-Israel lobby, the US will hike up their aid to Israel by 25% to US$30bn over a ten-year period. Although Israel's friends in Congress have vowed to oppose the Saudi deal, Israeli PM Ehud Olmert has come out in full support of the arms deal, citing Iran as its principal threat. Washington's desperate efforts to counter Iran's growing power in the region may fall short of their desired aim. Its attempt to forge an Arab-Israeli alliance to confront Iran will be at the very least fragile. Whilst Iran is perceived as the devil by most Sunni Arab regimes, the Islamic Republic fairs rather well in the Arab street. Many Arabs consider Iran as a defiant Muslim country standing up to US 'imperialism', Israeli aggression and defending the Arab/Islamic struggle. In fact, most Arabs have little love for their own US-backed autocratic regimes. Arab governments can only go so far in publicly warming to Israel before unrest and internal pressure becomes too much to bare. Lebanon is one great example of a pro-American leadership paralysed by public dissent. It should also be noted that the autocratic Arab states are not immune to the instability in the region. Bashar al-Assad probably enjoys more security than his co-dictators. As Islamic fundamentalism increases within Arab societies, the risk of internal conflicts and coup attempts loom as credible dangers. There are no guarantees against an Islamist coup in Egypt or Jordan. Or have the Americans still not learnt their lesson from Iran's 1979 Islamic Revolution? Islamic radicals will be pleased with the US arms deal as it only highlights what they've been saying all along ... that Arab leaders are American and Israeli pawns, and they must be overthrown. No doubt, the more countries like Saudi Arabia and Egypt move towards the US-Israeli axis, the easier it becomes for Islamists to recruit jihadists. Such desperate measures by the US were not entirely unforeseen. Whilst the Americans have been bogged down in Iraq, Russia has been working overtime to re-impose its presence in the region. Lucrative Russian arm deals to Syria and Iran have been ongoing since the Iraq invasion, with Israel attesting that some of that sophisticated hardware was used by Hizballah in the Second Lebanon War. 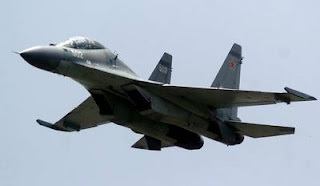 In the latest string of Russian arms sales, the Jerusalem Post revealed that the Kremlin has attempted to counter the American deal by signing a billion-dollar package to supply Iran with 250 advanced Sukhoi-30 fighter jets (pictured). This follows another major tri-nation military contract involving Russia, Syria and Iran only a few weeks ago, as reported by the London-based Arabic newspaper Al Sharq Al Awsat. The purchase included the supply of 400 Russian T-72 tanks to Syria. The buck doesn't just stop with the sale of sophisticated weapon systems. The Russian daily, Kommersant, divulged last year Moscow's plans to build a naval base on Syria's Mediterranean coast, making it Russia's first military base outside a neighbouring country. The journal also reported that the Russians would deploy ballistic missiles in Syria to protect the site. Such a deployment would extensively cover Syria from an air assault. Whilst all the commotion is being made of Iran's Russian-backed nuclear program, America's Arab allies (primarily Egypt and Saudi Arabia) have in the past year hinted at developing their own "civilian" nuclear program. Recently converted Western ally, Libya's maverick leader Muammar Qaddafi, just signed a deal with French President Nicholas Sarkozy for Paris to construct a nuclear reactor in Libya. It was only three years ago that Qaddafi came clean and renounced his secret nuclear program to win Western approval. The contents of the French-Libyan accord acutely echo the Russian-Iranian nuclear pact that has been at the centre of international controversy. Like Iran, the Libyans claim that their nuclear project is for civilian purposes only. Of course, this time the major powers bar Germany have accepted this argument. I highly doubt the Libyans will be summoned to the UN Security Council, particularly considering the Americans have publicly endorsed the deal. American double standards are not new, but their continued mishaps in this volatile region have laid the ground-works for a Middle Eastern arms race. Olmert may be praising the flurry of weapon sales to its neighbours today, but the time will come when Israel will be confronted by an Islamic world able to fight tough in combat. One ambiguity in assessing such dangerous policy is whether its Arab neighbourhood will remain under the control of America's proxy dictators or not. Iran's revolution 28 years ago is a solid indication that there are plenty of diehard anti-Israelis, bent on its destruction, eager to take the reigns. Israel should consider itself fortunate that the only leader declaring his desire for the Jewish state to be "wiped off the map" is Iranian. If they succeed in thwarting the Iranian threat, who will be Israel's next major menace? Will its existence be defined by constant war and conflict with its neighbours? Despite its military might, the Israelis must accept their reality ... they can't fight an entire world forever. Military superiority will not ensure Israel any victory or survival, with Lebanon once again proving the perfect case. The region has succumbed to their fear and paranoia of one another. At a time when direct negotiations and compromise are sorely needed, the players of this never-ending conflict have chosen yet again a dangerous direction with potentially devastating consequences. I suspect Russian and American arms manufacturers will be kept busy for the next decade as the Mid East arms race moves into full swing. The coming by-elections in Beirut and the Metn are heating up Lebanon's political scene once again. Both by-elections have come following the assassination of two loyalist MPs, Walid Eido (Beirut) and Pierre Gemayel (Metn). As both were members of the March 14 alliance, the loyalists were hoping the Opposition would leave the seats vacant for their candidates. In Lebanon, it seems we tend to make up our own rules of democracy. Lebanese democracy rarely invokes people power, but is rather an assortment of feudal oligarchs. Throughout Lebanon's short and turbulent history, elections have been based on the best deals between clan chieftains and who signs the larger cheques. As our system is designed on confessional and sectarian grounds, the Lebanese have tended to simply entrust their local chieftains to make the correct decisions, and continue their corruption. March 14 were hoping this Lebanese democratic tradition would continue, but alas, someone has finally said no more. The Free Patriotic Movement (FPM) has jumped to the occasion of a by-election and thrown in a candidate in the Christian heartland of the Metn. In Beirut, Najah Wakim's People's Movement has decided to contest the Hariri monopoly of the city. His candidate, Ibrahim Halabi, is unlikely to succeed on election day, but they have succeeded in finally providing an alternative for Beirut voters. In the 2005 parliamentary elections, all of Beirut's MPs were decided at a dinner table, with sole candidates for each district. Not much of an election in Western terms, but in Lebanon there's always exceptions. Of course, Western leaders and media continue to refer to March 14 as the "democratically elected majority". Ibrahim Halabi's candidacy is already a triumph for Beirut and Lebanon in general. Finally, there is an election! Of course, Lebanese rarely see true election contests. Whilst analysts and politicians refer to these by-elections as upping the ante in the tension, I am actually quite excited. Our people are going to genuinely experience a real democratic battle, which is exceptionally rare in our corner of the globe. It is my hope that the Lebanese will continue to actively engage in elections, and not simply allow the oligarchs to choose their seats of power over a Beaujolais. As expected, the oligarchs were not impressed when they heard that they would have to actually require public votes for their seats. Saad Hariri called those who dared to battle in the Beirut by-election as "assassins", while Amine Gemayel (former PM, Israeli ally and father of slain Pierre Gemayel) struggled to keep his calm when unleashing on FPM leader Michel Aoun. Although Hariri's Future Movement (FM) is expected to comfortably secure the Beirut seat, the stakes are much higher in the Metn. FPM is running into these elections beaming with confidence. They made a clean sweep in the predominantly Christian Metn in 2005, and in fact left Pierre Gemayel's seat vacant for him as a gift. The strategic gift by FPM to maintain warm relations with the Gemayel clan and their Phalange Party came to no avail. The latter became an addition to the March 14, and declared themselves as opponents of the FPM. Obviously, Aoun is not going to repeat the same mistake. He has already won the support of the Armenian Tashnag and MP Michel Murr, guaranteeing the FPM a handy 30,000+ in votes. As the FPM aim to secure total Christian support, Amine Gemayel is counting his days. This is a momentous development on Lebanon's political scene. The once all-powerful feudal Gemayel clan is about to be stripped of their political power. One clan down, several more to go. If the Christians of Lebanon are able to shed the community of their once most revered tribal family, perhaps it may set the wind of change for the other sects. Will the Druze ever turn against Jumblatt as the Christians are now turning against Gemayel? I hope it won't take another 70 years to remove another tribal powerhouse from their destructive positions of power. The Lebanese Forces (LF - another March 14 member), as well as the Maronite Patriarch Sfeir, are pleading for the FPM to leave the seat vacant. MP Pierre Dakkache is mediating to find a compromise candidate. Why? The decision is up to the people, this is democracy. No more corruption, no more under-the-table deals. It's time the Lebanese were given the opportunity to vote and decide between alternative candidates. I don't expect a compromise candidate, but I would not be surprised by violent outbursts in the run-up to the elections. As our army is incredibly over-stretched (from Nahr el Bared to the Israeli borders), under-equipped, and under-manned, this might be the prime occasion for some troublemakers to stir the pot. Then again, what is a Lebanese election without a few dead? That's one traditional trait we may just keep. Beirut: "a hotter tourist destination than Melbourne"
At last the Lebanese have something to smile about. Travel+Leisure magazine have released their annual tourist hot spots, with war-torn Beirut still finishing surprisingly well. The Lebanese capital scored higher than Commonwealth Games 2006 host Melbourne, shocking much of the local media here. Leading Melbourne newspaper, The Age, rans its headline on the story as "Melbourne 'worse than Beirut'" with an image of bombed out Dahiyeh at its side. The Italian gem of Florence won top prize, but it was Beirut's stubbornness to remain among the best which took the limelight. The survey is conducted annually by Travel+Leisure of world travellers and is highly considered around the globe. War with Israel, assassinations, bombings and terrorist incursions have been unable to deter would-be travellers from exploring the Beirut scene. Whilst tourism in Lebanon is expected to hit significant lows this summer, this poll is a warm indication that the world is awaiting the country's return. Lebanon has a lot of potential, there is no understating that, but the only obstacle thwarting our intention to exploit that potential is the Lebanese. Once they begin to value and appreciate their country as the world obviously does, we will begin to realise our ambitions of peace and prosperity. Melbourne has been battered in a respected annual survey of world travellers, ranked behind cities such as Bangkok, Cape Town and Beirut. Sydney is in the top 10, but is on the slide. No other Australian cities managed to make Travel+Leisure magazine's Top 10 World's Best Cities poll. For the second consecutive year Sydney, once the undisputed No. 1 ranked city on the planet, slipped further down the ladder. The poll, released in the US on Tuesday, ranked Sydney as the fifth best city in the world. Italy's Florence was voted No. 1, Buenos Aires was second, Bangkok third and Rome fourth. Last year, Sydney was ranked fourth. It has been a fall from grace for Sydney as Travel+Leisure's subscribers, who decide the poll, for almost a decade had the harbour city as their top city in the world. In eight of the last 12 years, Sydney was ranked No. 1. This year Sydney beat New York (sixth), Udaipur, India (seventh), Istanbul (eighth), San Francisco (ninth) and Cape Town (tenth). The poll is respected as Travel+Leisure goes to great pains to weed out travel industry professionals from voting. Subscribers are also prevented from voting more than once. Travel+Leisure did rank the top cities in Australia, New Zealand and the South Pacific, with Sydney easily coming in first with a score of 86.27 out of 100. Melbourne was second (79.82), with New Zealand trio Queenstown (78.73), Christchurch (76.60) and Wellington (75.43) rounding out the top five. Although Melbourne's score was up on last year's figure of 79.62, the result still placed it well behind cities such as Bangkok (86.56), Cape Town (84.12) and even Beirut (83.75). Subscribers were also asked to rate the world's hotels, airlines, islands and cruises. Australia could not manage one hotel in the top 100, while New Zealand's Huka Lodge, in Taupo, did manage 58th. India's luxury Oberoi Udaivilas hotel in Udaipur was named the world's best hotel, South Africa's Singita Sabi Sand hotel in the Kruger National Park was second and third was The Oriental in Bangkok. In the Australia, New Zealand and South Pacific hotel sub-category, Huka Lodge was No. 1, Sydney's Observatory Hotel No. 2, French Polynesia's Bora Bora Lagoon Resort & Spa No. 3and Sydney's Four Seasons Hotel No. 4. The top ranked Melbourne hotel was the Langham in seventh place and Queensland's top hotel was the Mantra Treetops Resort & Spa in Port Douglas in 13th. In the islands category, Bali was named the No. 1 island in the world for a holiday, followed by Maui, Kauai and the Galapagos Islands. The magazine grouped Australia's Great Barrier Reef islands together and they came in as the world's No. 10 island destination. Singapore Airlines was once again named the top international airline, newcomer MAXjet Airways, an all business-class airline, was second, Emirates third, Cathay Pacific fourth and Thai Airways fifth. Qantas picked up one spot from last year's survey to claim the seventh position. Crystal Cruises was the No. 1 ranked large ship cruise line. Of particular focus are Christian politicians who have joined into a formal political alliance with Hezbollah in a bid to unseat Mr. Siniora. Some of them, such as retired Gen. Michel Aoun, have in the past coordinated closely with the U.S. on Lebanon policy, particularly on the need to reduce Syrian influence. They also have presented themselves as potential allies to Washington if any new government is formed in Beirut. administration official working on the Middle East. “We want to convey to them that there’s a price to pay” for their actions…..
Aoun has had a rocky relationship with the US. He depended on their assistance in 1990 when the General decided to launch a hopeless war against the Syrians. US assistance never arrived. Instead, the Americans made an agreement with Damascus, betraying Aoun, and allowed the Syrians to dominate Lebanon in return for their aid against Saddam's Iraq. However, during his 15 years in exile in France, Aoun worked effortlessly to lobby US officials to pressure Syria to relinquish Lebanon from its grip. Indeed, this period saw a thaw in relations between Michel Aoun and the Americans. The two sides again parted ways when the General withdrew his support for America's Lebanese allies - the March 14 alliance - and forged an alliance of his own with Israel's arch nemesis, the Shi'ite Hizballah. The memorandum of understanding between the two political heavyweights outraged the Bush administration. Aoun's new political party, the Free Patriotic Movement (FPM), commands the largest Christian backing in the country. As ties between the FPM and Hizballah consolidated, popular support gathered. Analysts viewed it as an Iranian and Syrian-backed Christian-Shi'ite alliance pitched against the US/Saudi/French-backed Sunni-Druze alliance. Israel's war against Hizballah did nothing to weaken this alliance. To the contrary, it only enhanced its power as the Shia party came out victorious in the conflict. Riding on a wave of momentum and public support, both within Lebanon and throughout the Arab world, Hizballah and the FPM launched a massive campaign to overthrow the pro-American government. Roughly two millions demonstrators poured onto the streets of Beirut on two occasions demanding the resignation of the government. Tents have remained in the city centre since, as the call for resignation has placed the country in a paralysing deadlock. The Americans are the only power holding the March 14 gathering together. The Israeli loss, and the subsequent mass demonstrations have put the Americans on the back-pedal in Lebanon. The US have blocked every attempt for a compromising negotiation, and are adamant they will defeat Hizballah. This week, they targeted diplomatic pressure on Lebanon's Christian community via the FPM and Michel Aoun, in a bid to break him from Hizballah. The Bush administration believes it has many financial and political strings attached to the FPM that it can cut. The travel ban on some of the FPM's allies is disguised as a direct warning to it. The Syrians may not care about a travel ban, but the Americans are betting Michel Aoun will if he is added to the list. Will it force the General to back down? I sincerely doubt it. Momentum is still on the side of the Lebanese Opposition, and I am not sure the Americans will fulfil their threat by imposing travel bans or any other type of sanctions upon the FPM. If the US is hoping to resurrect its chances in the battle for Lebanon, it is going to have to win the support of the Christian community, rather than alienate it. I suspect any move by Bush to sanction the FPM will backfire and entrench the Christian community further in their partnership with Hizballah. Robert Fisk viciously attacked the appointment of Tony Blair as the Quartet's Middle East peace envoy. "I remain overwhelmed that this vain, deceitful man, this proven liar, a trumped-up lawyer who has the blood of thousands of Arab men, women and children on his hands is really contemplating being "our" Middle East envoy." I, too, am incredibly perplexed by the decision to throw the cape of peace on a man of war. Undoubtedly, Blair proves as President Bush's prime candidate to deal with Middle Eastern issues on the Quartet's behalf. Despite Russian disapproval, the Quartet went ahead with the appointment of a man likely to create more anarchy in the region than reconciliation. I beg to wonder whether the person responsible for reviewing Blair's CV for this job actually read it. This man, as Fisk so eloquently points out, lied to his own people about going to war in Iraq; has hundreds of thousands of Iraqi civilian blood on his hands; blocked every attempt to halt Israel's barbaric onslaught on Lebanon last summer; need I say more? Most experts, analysts, anyone who has common sense would conclude from reviewing such a CV that this man is certainly not fit for the job. So the question arises, why was the post given to him? The Bush Administration is in no mood for dialogue, let alone a just peace proposal, thus the more neocons in the powerful diplomatic positions, the easier it will be to avoid the desperately needed negotiations to put an end to this quagmire. The US and Britain are entangled (on Israel's behalf) in a regional war with Iran and Syria. Despite the mounting domestic and international pressure on Bush, he has shown no sign of relenting on the campaign. The only signs he has shown are that of his determination to see this war to the end. Who better to have on his side than the man that has been joined to the Texan's hip since the get-go? Blair's role is not to resolve the Middle Eastern nightmare, but to serve as an American barrier to any European or Russian attempt to use the Quartet as a means to counter the US' war policy in the region. We can only expect what Blair can do best. He will sideline Hamas, endorse Fatah; continue to talk tough to Syria and Iran; deliver unwavering support to Israel; threaten Hizballah, and support the highly unpopular Siniora government; help to prop up the American proxies of Saudi Arabia, Egypt and Jordan; everything that is required of a participant of the US-Israeli axis and everything against peace. A true peace envoy would engage with all sides of the conflict, from Gaza to Tehran. I highly doubt we can expect such effort from our mate Tony. The former British PM will only be another neocon element ensuring the flames will continue to burn in the Middle East.